It’s the 26th week of the year and the Sun is in Cancer. The card of the week is the Queen of Pentacles and the number of the week is 8, a number that brings change as things start to move forward. 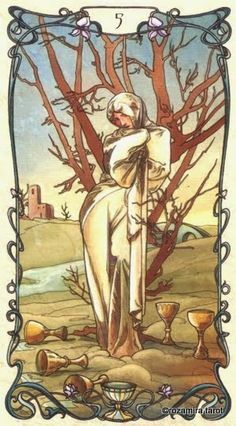 If you’ve been feeling stuck financially, this week will bring big gains for you as you finally begin to move forward with the help of the Queen. She nurtures the side of us that craves material things by bringing abundance with her when she appears. 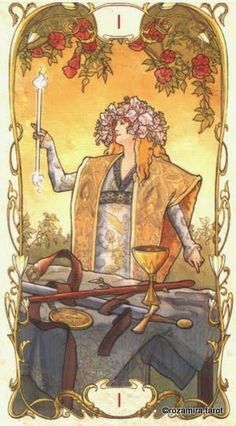 If you are already financially well off, she encourages you to take the time this week to balance your work and your home life to bring about material gains. Magdalena Tarot does not claim the rights to any of the images on the Tarot cards included in this forecast. Click newsletter to subscribe to my newsletter. All times in the Forecast are set to Eastern Standard Time. For time conversions, go here. 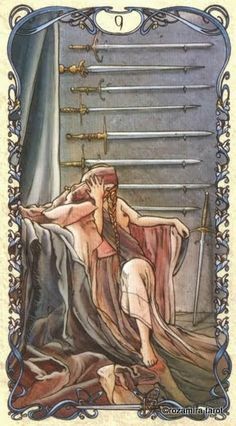 http://www.timeanddate.com/worldclock/converter.html Sunday 7/5/15 9 of Swords Numerology: 2 Moon Void of Course 8:31 AM EST Moon Enters Pisces 10:23 AM EST The Nine of Swords is a card that appears when you may be stressed out and find worries cycling constantly through your head. But the aspects of the day encourage us to speak up about these worries and open up lines of communication in order to do creative problem solving. With Moon trine Mercury, when you speak, people will listen and respond. Mercury sextile Venus is a wonderful time for social interactions, clarity and harmony so don’t hold back if you need to get something off your chest. The only exception is in matters of love. If you’re worried about your love life, the Moon opposite Venus cautions you to take a good look at your worries and see if they’re valid or if you’re just overreacting. Remember that the Moon is in Pisces, so your intuition is going to be intensified but the Sun is in the emotional side sign of Cancer so you may be just blowing your feelings out of proportion. With the Moon square Saturn, remember that problems aren’t solved overnight so have patience when approaching any difficult situations. Moon trine Mars reminds you that in order for any change to happen, you have to have the courage to make that change. The number of the day is 2, a number that calls for balance. Mantra: By communicating effectively, I can calm the worries in my mind and bring balance back to my life. Monday 7/6/15 5 of Cups Numerology: 3 Moon in Pisces The five of cups is a card that teaches us that even though we may have disappointments in life, when we learn to overcome them, our life becomes full again. The Moon forms an opposite with Pluto, bringing about mood swings. The Moon trine Pluto may bring some uncomfortable truths to the surface but despite the challenging aspects, there’s good things happening all around you. The Moon is still in Pisces and the Sun is still in Cancer so don’t make too big of a deal out of the negative things your intuition may tell you. Simply accept them and move past it. The Moon makes an opposite with Neptune and the people you encounter will be happy, warm, kind and understanding. The Moon trine Sun brings free flowing harmony. The number of the week is 3, a number of unity. Things are coming together and even though it may appear that there have been some setbacks, really, the Universe removed what you don’t need because there’s something better waiting for you. Mantra: I refuse to cry over spilt milk. Tuesday 7/7/15 The Magician Numerology: 4 Moon Void of Course 10:36 AM Moon Enters Taurus at 12:37 PM The Card of the day is the Magician, reminding you that you, inevitably, are the master of your own destiny. This goes well with the Moon moving into Taurus because when the Moon is in Taurus, it’s an excellent time to start new projects and say “yes” to new opportunities. You want to be cautious when what you say and do, however, because Moon square Mercury can muddle your connections with people. Just make sure you have know what you’re going to say before you go into any situations that communication, business, speech making and writing. The Moon trine Saturn is another good omen for work and business but you need to be highly organized if you want to be successful. The number of the day is 4, a number of stability. By strategic planning, you will bring build a strong foundation for any new beginnings that occur today. Mantra: Envision it, plan it, manifest it. 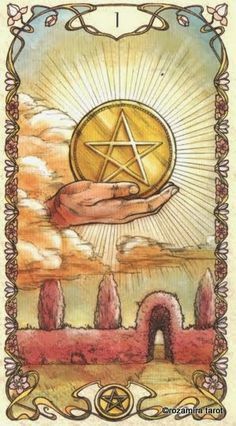 Wednesday 7/8/15 Ace of Pentacles Numerology: 8 Last Quarter 4:26 PM Moon in Aries The Ace of Pentacles is a card that appears when new beginnings in wealth and abundance are at hand. There are some obstacles with the aspects in the stars, however, that may stand between you and that potential if you get stuck dwelling on the negative. Moon square Mars may leave you feeling pugnacious, especially with the jealous energy of Moon square Pluto hanging around. Maybe someone at work got the promotion that you wanted or the person that you wanted to ask on a date started seeing someone else. Whatever doesn’t work out is just that: something that didn’t work out. Its’ the last quarter and it’s a time to recognize that everything has come full circle and that if you didn’t get what you want, that’s OK because a new lunar cycle is about to begin. You may be feeling cheated out of abundance that you feel like you deserved but once the evening rolls around, the aspects in the stars will begin to shine more favorably. Mars trine Neptune will give you the imagination that you need to focus on your next dreams and plan how to get them. The negative feelings you experienced earlier in the day will just increase your drive toward your goals with the Moon conjunct Neptune. When the disappointment clears, you’ll see that there are new, exciting opportunities waiting for you and you’ll be more than ready to take a chance, jump right in and take them. These new opportunities will give you a sense of freedom and liberation in the end so act now! The number of the day is 5, a number of adversity. Mantra: By overcoming challenges, I’m ready to face what lies ahead. Thursday 7/9/15 6 of Wands Numerology: 6 Moon Void of Course 9:47 AM Moon enters Taurus 3:49 AM Today is a day to be proud of yourself and celebrate all the victories that you’ve had. News of success and acknowledgement of your talents is on the way. The Moon enters Venus ruled Taurus, bringing beauty and stability to your life. Any projects that you began are now ready to be wrapped up and sent off with a blessing for success. It’s also a very good time for business with Moon trine Jupiter. These dealings will be happy, joyful and business transactions will be done without any setbacks. In all, love and peace are in the air with Moon trine Venus. It’s also a good day for teamwork and ideas will flow freely thanks to Moon sextile Mercury. 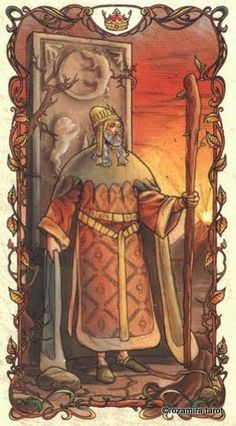 The number of the day is 6, as well as the number of the card of the day, emphasizing that this surly is a day for good things to come your way. Take a minute to give thanks for everything you have been given and celebrate the wonderful person that you are. Mantra: Hard work pays off. Friday 7/10/15 The Tower Numerology: 7 Moon in Taurus The Tower is a card of upheaval, either through disaster or through a sudden revelation that changes the way you see everything. In other situations, it can also predict really, really bad weather and natural disasters. But whatever the case, when the Tower appears, you know that sudden, violent change is on the way. The Moon is in Taurus, a sign that finds stability in what you have rather than what is possible, which may make you resistant to change. But in my experiences, the action leading to those changes brought by the Tower isn’t always catastrophic, so approach everything that happens today with an open mind and be ready to see all sides of situations. The Moon sextile Neptune will help you with this because it brings inspiration and enlightenment. The truth will be illuminated and it’s up to you how you interpret it. If you’re facing a tough decision, Moon sextile Mars will give you the courage to take the leap of faith and make that decision. In the end, that decision will be the best one even though it seems like the most risky. With how volatile the atmosphere is, you may have emotional outbursts thanks to Moon trine Pluto but those outbursts will clear the air and help elevate any of the initial shock you face from the influence of the Tower. The number of the day is 7, and interestingly enough, the number of the Tower card, 16, which adds up to 7. So the lesson of 7, discovery through knowledge, is extremely important today. All in all, be prepared for some surprising news but its better you found out than never know at all. Once the shock fades, you can decide how to move forward. Mantra: The more you know. 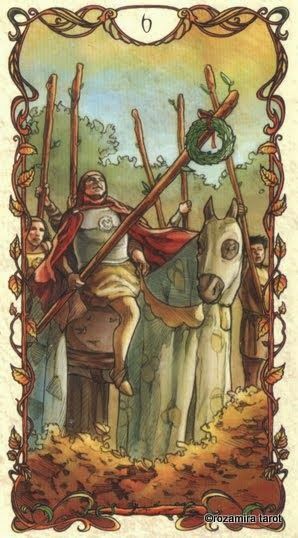 Saturday 7/11/15 King of Wands Numerology: 8 Moon Void of Course 5:52 PM EST Moon Enters Gemini 8:16 PM EST The King of Wands is a goal oriented individual who knows how to take what he has and sculpt it to fit his desires. The Moon is in Gemini, which emphasizes that communication is key in all matters today. The Moon trine Sun will bring about harmony but the Moon square Jupiter cautions against doing anything in access. You may have a hard time expressing your emotions, especially in your love life due to the Moon square Venus, but the Moon opposite Saturn reminds you to curb any sulking that could lead to depression and have patience in hardships. See the power you have at hand and enjoy what you have instead of dwelling on what could be different. The number of the day is 8, a number of movement, action and change. Mantra: I create my own reality. This entry was posted in Astrology, mysticism, numerology, occult, Qabalah, self help, spirituality, Tarot, witchy, Writing and tagged astrology, divination, motivational, numerology, occult, self help, tarot, witchy. Bookmark the permalink.